Dawnbreaker Farms produces the finest meat for sale in the Triangle. All of our animals are pasture raised and GMO-free with the highest care for animal welfare and environmental regeneration. You can find our products for sale at the Carrboro Farmer’s Market, in select retailers and fine dining establishments across the Triangle. Dawnbreaker Farms is your source for local, pasture-raised and GMO-Free chicken. Our non-GMO chickens free range on grass where they can graze our sustainably managed pastures and hunt for bugs. They are raised in a “chicken tractor” which is a portable floorless shelter that is moved daily. Daily moves ensure that our chickens are always on fresh pasture with ample grazing opportunities. 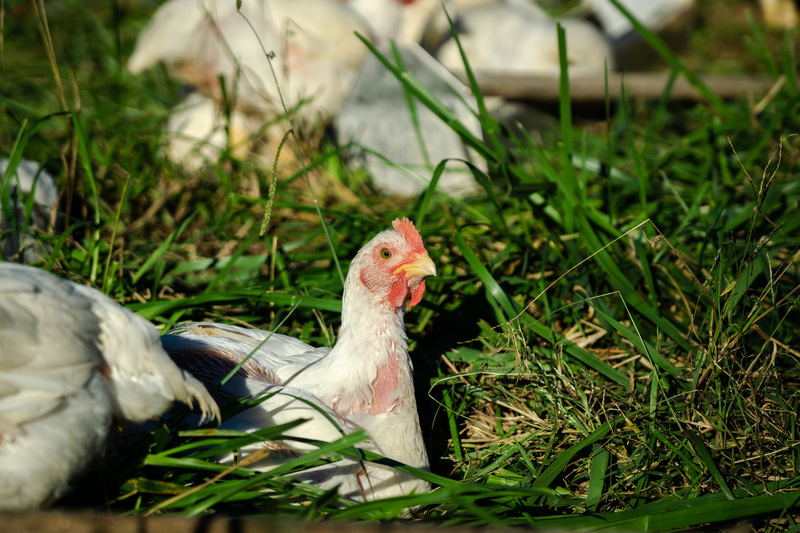 The result is a healthy free-range and sustainable chicken that has picked up great flavor and nutrition from the grass and sunshine. Along with pasture our chickens are supplemented with a non-GMO grain ration. Our sustainable, GMO-free chickens are a sure hit for you and your family! Chickens are processed right here on the farm in our state inspected facility to ensure that they are handled with respect and dignity to the end. After processing and packaging our chicken is frozen immediately to preserve quality and nutrition. If you are looking for a local, GMO-Free, ethical, sustainable, free-range and beyond organic chicken than Dawnbreaker Farms is your farm! Find our healthy chicken at one of our farmer’s markets, Triangle Buying Clubs or at one of our wholesalers. Country Farm and Home in Roxboro, NC at Hall’s Way Shopping Center also offers our pasture-raised chickens. Dawnbreaker Farms pigs forage, wallow and root through our 10 acres of forest scooping up acorns, grubs and roots while revitalizing our woodlands. Our free range pigs enjoy the cool shade of the trees where their actions are extremely beneficial. Through tilling, rooting and generally romping around our forest ecosystem is improved as the pigs open it up to sunlight, periodically clear the forest edges, till under leaf duff and improve the carbon cycle. Managed properly our forest raised pigs restore ecosystem function in our woodlands and accomplish one of our ecological missions. Along with the grasses, forbes, roots and other foraged goodies Dawnbreaker Farms forest raised pigs are fed a completely non-GMO grain ration. We love having pigs in our woods and our customers regularly tell us our forest raised pork is the best they’ve ever had. We attribute this to the happy life our non-GMO pigs live doing what nature intended them to do. 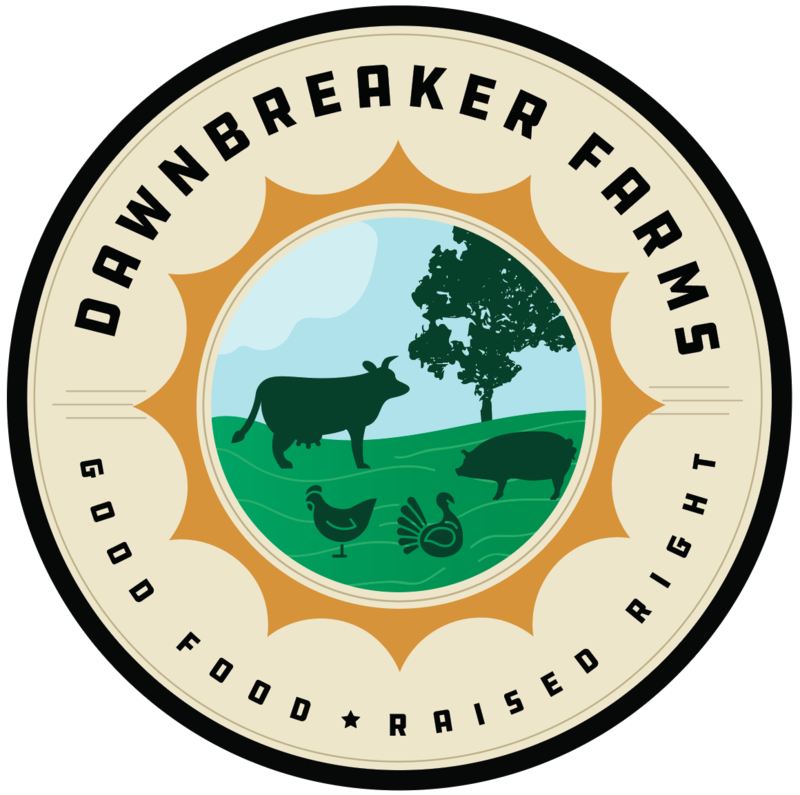 If you are looking for a pasture-raised, GMO-free, ethical, local and sustainable source of pork than Dawnbreaker Farms is your farm! Reserve your 2019 Thanksgiving Turkey Now! Dawnbreaker Farms Thanksgiving Turkeys are pasture-raised and GMO Free. They spend the entire season chasing grasshoppers, grazing our pastures and basking in the sunshine. Our non-GMO turkeys make a fantastic centerpiece to your holiday celebration. With flavor to remember and a story to tell our free range turkeys will be a hit with your holiday crowd and ensure a repeat event in 2019. We regularly post videos and photos of our Thanksgiving Turkeys on social media sites as they grow throughout the season so that you can “get to know” your turkey before the big day. If you are looking for a free range, beyond organic, non-GMO, local and sustainable turkey than Dawnbreaker Farms is your farm.